The community gathered to pay their respects to the 15 killed and 14 injured in a horrific bus crash. UPDATE - April 11, 2018: The crash's death toll has risen to 16 since the vigil. Dayna Brons, 25, died in hospital from her injuries on April 11. She was the team's athletic therapist. HUMBOLDT, Sask. — There were tears and hugs as hundreds gathered to remember 15 people who died when the Humboldt Broncos junior hockey team bus crashed with a tractor trailer late last week. People laid flowers in a circle around centre ice in the Saskatchewan town's rink as family and friends of players listened to prayers and hymns. Mourners comfort each other as people attend a vigil at the Elgar Petersen Arena, home of the Humboldt Broncos, to honour the victims of a fatal bus accident in Humboldt, Sask. on April 8, 2018. Humboldt Broncos player Nick Shumlanski, who was released from hospital on Sunday, is comforted by a mourner during a vigil at the Elgar Petersen Arena, in Humboldt, Sask. on April 8, 2018. "I want to say to all the Humboldt Broncos families, billets, coaching staff, teammates, classmates, teachers, friends, community members: Not one of us is alone in our grief,'' he said. He thanked Canadians and people around the world for their support. "In all this darkness, a light has shone through," he said. "This light has come from the first responders, from the medical professionals, who have worked miracles and continue to work miracles for those members of our Broncos family. 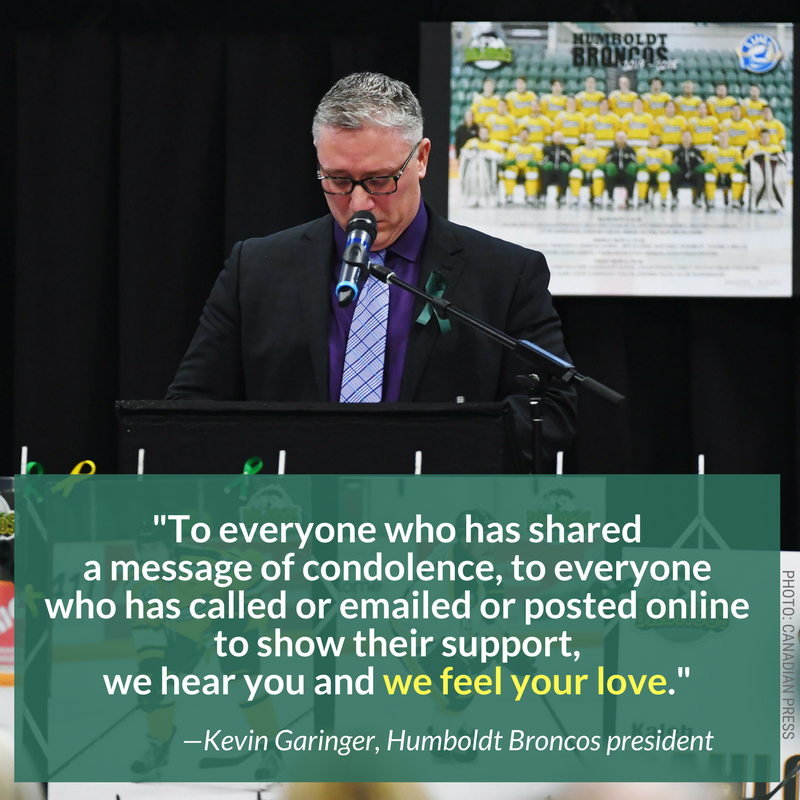 It comes from the remarkable community of Humboldt and the countless communities from across our country as people come together to offer their strength, their time and their kindness. This light has come from people across this globe reaching out to offer condolences and share a staggering level of generosity and support. This light will only grow in time. And in time the darkness will be less." Prime Minister Justin Trudeau attends a vigil at the Elgar Petersen Arena to honour the victims of a fatal bus accident in Humboldt, Sask. on April 8, 2018. Family and friends also shared more stories Sunday of their memories of those lost and unbreakable bonds forged by a love of the hockey. Mourners comfort each other as they look at photographs prior to a vigil at the Elgar Petersen Arena, home of the Humboldt Broncos, to honour the victims of a fatal bus accident in Humboldt, Sask. on April 8, 2018. While the wreckage had been removed, there were still playing cards and a broken DVD of the movie "Slap Shot'' scattered in the ditch. The Hanson brothers, popular characters in the movie, tweeted condolences to the Broncos on the weekend, as did other celebrities.